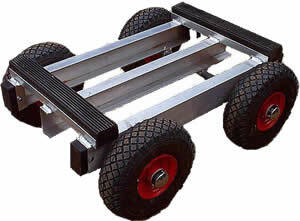 This Heavy Duty Piano Truck trolley is designed to cover rough terrain. This Piano Truck is specially designed for easy and safe movement of pianos and other heavy objects. The Alan Stuart Engineering Ltd heavy duty piano truck trolley is unique in its all welded construction. Being welded throughout there are no bolts or split pins used, making the piano trolley extremely strong and rigid. Non-marking rubber buffers are fitted on each corner of the piano truck and ribbed non-slip rubber blocks are fitted on the top channel. For more information on Piano Trolleys, Hand Trucks, Removal Handling Equipment then please contact us.